The Revival of the Religious Sciences is divided into four parts, each containing ten chapters. Part one deals with knowledge and the requirements of faith—ritual purity, prayer, charity, fasting, pilgrimage, recitation of the Qurʾān, and so forth; part two concentrates on people and society—the manners related to eating, marriage, earning a living, and friendship; parts three and four are dedicated to the inner life of the soul and discuss first the vices that people must overcome in themselves and then the virtues that they must strive to achieve. Below we list the contents of the book, English translations, and links to printed editions in the original Arabic. For more information on the Arabic language printed editions please see here. Al-Ghazālī: The Book of Knowledge, Translated by Kenneth Honerkamp, Louisville, KY: Fons Vitae, 2015. English translation by N. A. Faris (PDF). Book 2: Foundations of Belief. Al-Ghazālī: The Principles of the Creed, Translated by Khalid Williams, Louisville, KY: Fons Vitae, 2016. English translation by N. A. Faris (in HTML and PDF). Review of the Faris translation by Watt (in 1964). Book 3: Mysteries of Purity. Al-Ghazālī: The Mysteries of Purification, Translated by M. F. Aresmouk and M A. Fitzgerald, Louisville, KY: Fons Vitae, 2017. Book 4: Mysteries of Worship. Al-Ghazālī: The Mysteries of Prayer, Translated by M A. Fitzgerald, Louisville, KY: Fons Vitae, 2018. English translation by E. E. Caverley (also in PDF). Book 5: Mysteries of Zakat (Charity). Al-Ghazālī: The Mysteries of Charity and the Mysteries of Fasting, Translated by M A. Fitzgerald, Louisville, KY: Fons Vitae, 2018. Book 6: Mysteries of Fasting. Book 7: Mysteries of Pilgrimage. Al-Ghazālī: The Mysteries of Pilgrimage, Translated by M A. Fitzgerald, Louisville, KY: Fons Vitae, Forthcoming in 2019. Book 8: The Etiquette of the Recitation of the Qurʾān. Al-Ghazālī: The Etiquette of the Recitation of the Qurʾān, Translated by James Pavlin, Louisville, KY: Fons Vitae, Forthcoming. Book 9: Invocations and Supplications. Al-Ghazālī: Invocations and Supplications, Translated by Khalid Williams, Louisville, KY: Fons Vitae, Forthcoming. English translation by K. Nakamura (ITS description). Book 10: On the Arrangements of Litanies and the Exposition of the Night Vigil. Al-Ghazālī: On the Arrangements of Litanies and the Exposition of the Night Vigil, Translated by Muhtar Holland and James Pavlin. Louisville, KY: Fons Vitae, Forthcoming. Arabic original (Word file format only!) with ḥadīth verifications. Another English translation The Proper Conduct of Marriage in Islām (Ādāb an-Nikāḥ) Book Tweleve of Iḥyāʾ ʿUlūm ad-Dīn by M. Holland: Al-Baz Publishing (1998), 99p. German translation: Hans Bauer: Al-Ghazālī. Das Buch der Ehe. 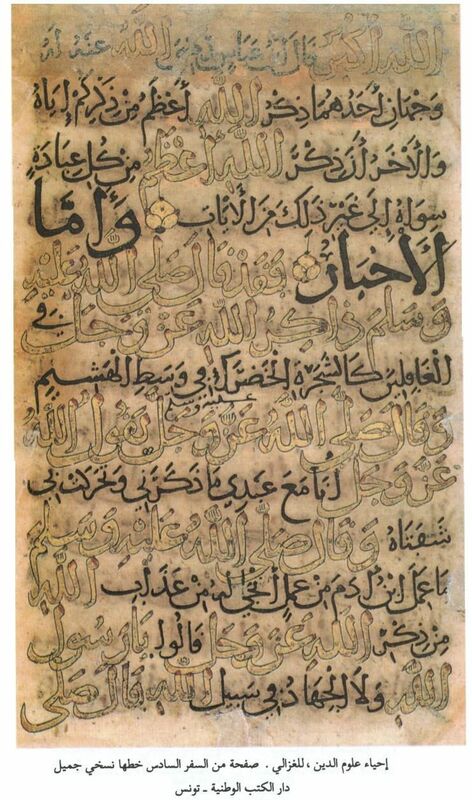 Kitab adabi n-nikah. Das 12. Buch der Iḥyaʾ ʿulum ad-din. Übersetzt und kommentiert von Hans Bauer (Kandern, Spohr, 2005). Book 13: On the Etiquette of Acquisition and Earning a Livelihood. Translated as The Book of the Proprieties of Earning and Living, translated by Adi Setia, IBFIM , Kuala Lumpur, 2013, 187pp, ISBN: 9789670149288. Book 14: The Lawful and Prohibited (Translated) Translated as the Book of the Lawful and the Unlawful, translated by Nicholas Mahdi Lock, IBFIM, Kuala Lumpur, 2013, 258pp, IBN: 9789670149271. 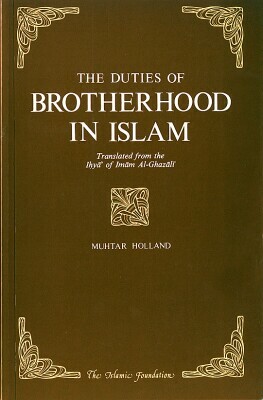 Book 15: On the Duties of Brotherhood. Partial translation by M. Holland. (cover-image) (Arabic edition partial outtakes PDF). Book 16: On the Etiquette of Seclusion. Book 18: On Music and Singing. Translated by D. B. MacDonald in three parts (PDF) Part I + II + III, published as Music and Singing by IBT Books, Kuala Lumpur, 2009, 139pp. ISBN: 9789675062230. Book 19: On Enjoining Good and Forbidding Evil. Al-Ghazālī: The Commanding of the Good and Forbidden of the Wrong, Translated by James Pavlin. Louisville, KY: Fons Vitae, Forthcoming, late 2019. Partial translation in Michael Cook’s Commanding Right and Forbidding Wrong in Islamic Thought, Cambridge: Cambridge University Press, 2000, pp. 427-459. New translation by Dr. Adi Setia, Louisville, KY: Fons, forthcoming, 2019. Complete English translation by W. J. Skellie (PhD thesis (PDF), Hartford Seminary—published edition (Fons Vitae March 2010). N.B. that Skellie translated the edition that was published by Zabidi in his commentary on the ihya’ which has slight variations from the standard Cairo edition. These have been restored in the Fons Vitae edition. Partial translation in Knowledge of God in Classical Sufism by John Renard (New York: Paulist Press, 2004), pp. 298–326. Also published as Wonders of the Heart (Malaysia: IBT, 2007), without the complete translator’s introduction and notes; includes an index and publishers note. Book 22: On Disciplining the Soul. English translation by T. J. Winter (ITS description). Book 23: On Breaking the Two Desires. Book 27: Condemnation of Miserliness and Condemnation of the Love of wealth. Book 28: Condemnation of Status and Ostentation. Translation of its Arabic Summary. Book 30: Condemnation of Self-Delusion. Part I is now available in html. German translation: Books 31–36: Richard Gramlich, Muhammad al-Gazzālīs Lehre von den Stufen zur Gottesliebe : die Bücher 31-36 seines Hauptwerkes. Eingel., übers. u. komment. von Richard Gramlich (Wiesbaden, Steiner, 1984). Book 32: On Patience and Thankfulness. English translation by H. T. Littlejohn. (ITS description). Book 35: Faith in Divine Unity and Trust in Divine Providence. German: Hans Wehr, Al-Gazzālī‘s Buch vom Gottvertrauen. Das 35. Buch des Ihyaʾ ʿulum ad-dīn. Übers. u. mit Einl. u. Anm. vers. v. Hans Wehr. Halle: Niemeyer, 1940. Book 36: On Love, Longing, Intimacy and Contentment. (English Translation, E. Ormsby, 2012, ITS). For German see above #31. Book 37: On Intention, Sincerity, and Truth. Edited Arabic PDF. Edited Arabic MS word. English translation by A. F. Shaker (ITS description). Book 38: On Holding Vigil and Self-Examination. Sample of the book. (PDF) courtesy of the publisher. Printed Editions: Please go to this page for more details on fourteen (14) printed editions including the most recent editions printed in the twenty first century. Iḥyāʾ ʿulūm al-Dīn was first printed at Būlāq, 1269/1853 followed by a lithograph in India in 1863, then in 1894 on the margins of its commentary which is one of the most reliable editions to date. In the 25 Spetember 1939 Cairo edition by the Ḥalabī press it was edited by a committee of scholars headed by the Azhari scholar Aḥmad saʿad ʿAlī it was printed with the now standard addendum and marginal text of al-ʿIrāqī. All later publishers would follow suit with few modern exceptions. al-Ghazālī. Iḥyāʾ ʿulūm al-Dīn. Cairo: Lajnat Nashr al-Thaqāfa al-Islāmiyya, 1356–57 (1937–38). This is the edition that the Dār al-Shaʿab based their editon on. It has been recreated here with the pagination in red on the pdf files. Thanks is due to Prof. Frank Griffel for this information, his help in recreating this edition and providing the scans of the missing pages. Do note that this is a very readable and an accurate edition that is used for scholarly work. SUMMARIES: There are many summaries of the Iḥyāʾ, though only a handful are published; the others remain in manuscript form. For more information about the summaries of the Iḥyāʾ in Arabic, see this short article (Arabic html). Summary by Aḥmad al-Ghazālī (pdf) Lubāb al-iḥyāʾ, published as Mukhtaṣar Iḥyāʾ ʿulūm al-dīn. The publisher claims that it is by Abū Ḥāmid al-Ghazālī, though I believe this is incorrect. (PDF). This book has been translated into English: Imam Al-Ghazālī Mukhtaṣar iḥyāʾ ʿulūm ad-dīn translated from the Arabic, and annotated by Marwan Khalaf. Lympia/Nikosia, Cyprus: SPOHR, 2014. Tahdhīb mūʿaẓat al-mūʾminīn, Jamāl al-Dīn al-Qāsimiī n.p. n.d. Note that he also did a sumarry of Qūt al-Qulūb (PDF), (PDF) . Modern summary of the Iḥyāʾ comes from Saliḥ Aḥmad al-Shāmī, al-Muhadhab min iḥyaʾ ʿulum al-dīn, 2 vols. (Beirut: Dār al-Qalam, 1993). Sample translation (link) Also another edtion is available from Dār ibn al-Qayīm: PDF. This is an admirable attempt that closely follows the structure of the original book. The late Saʿid Ḥawwa (d. 1989) wrote a summary for a training curriculum: al-Mustakhlaṣ fī tazkiyat al-anfus (Cairo: Dar al-Salam, 1984). (PDF) The author/activist was a prolific writer. ʿAbd al-Qādir al-ʿAydrūs, Taʿarif al-aḥyāʾ bi faḍʾil al-iḥyāʾ (Introducing the living to the benefits of the Iḥyāʾ) printed as an appendix in some editions of the Iḥyāʾ (pdf). Note the pun in the title, which is, of course, intentional. al-Suyūṭī, Tashyad al-ʾarkān fī laysa fī al-imkan ʾabdaʿ mimā kān (Fortifying the foundations of [the statement] “the best of all possible worlds” ) printed as an appendix in some editions of the Iḥyāʾ (PDF). Note also this work was the basis of a study done in Theodicy in Islamic Thought: The Dispute over Al-Ghazālī’s “Best of All Possible Worlds” by Eric L. Ormsby (Princeton: Princeton University Press, 1984). Unknown author: Risala fi bayan faḍil iḥyāʾ ʿulum al-dīn (mss in al-Azhar number 1956 [majami 91] folios 76-86). Refutations: The Iḥyāʾ has generated some heated discussions mostly revolving around the traditions that al-Ghazālī included. Fatawas (judicial decrees) by scholars and these are too many list or know but Ibn Taymiyya is known to have written one as well as al-Ṭarṭushi. Even in modern times there have been fatwās issued by Saudi ʿulamāʾ. A typical critique along those lines is by ʿA. R. Dimashqīya: PDF. Turkish translation of the Iḥyāʾ. A growing number of Arabic manuscripts are now available online. King Saud University manuscript collection. A link to one such ms copied in 12th cen AH by ʿA. A. Kanānī, a partial ms. More manuscripts are available here: link2, link3, link4, link5, link6, link7, link8, link9, and a summary here, Mukhtaṣar Iḥyāʾ ʿulūm al-dīn: link10. Princeton University Library, has a complete copy of the ihya but it is not available online yet, we can hope. Illuminated manuscript. (scanned from the Tunisian National Archives).